Humanity was struggling to catch up with its alien neighbours when Terra ceased to exist. The attack had been a long time coming; it crossed light-years of space before impact. Thousands of relativistic weapons swept across the system in a matter of hours, moving too swiftly for anyone to see them coming, try to escape, or to warn anyone else what was happening. When they struck the homeworld, the surface of Terra became a molten holocaust, and oceans boiled away into the tortured skies. Every settlement of Luna, Mars, and the Galilean moons met the same fate. Colonies on smaller moons and asteroids simply shattered, vaporized by the impact. In the final hours of the attack, on the fringe of Sol's Oort cloud, the last comet-herders were just beginning to figure out something was wrong as they went off the air, one by one. And then it was over. 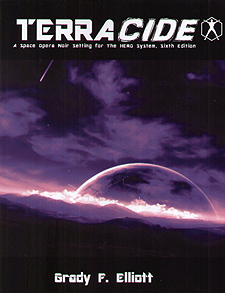 Terracide by Grady Elliott is a gritty, space opera noir. The Earth has been annihilated, leaving only the few million humans who were working in deep space alive. Those who have survived must not only continue the human race, but discover who - or what - destroyed their home world. Players can chose from character packages that include private eye, pirate, socialite, solider, and many, many more.